Van Meter Elementary Kids GO WILD! I have been teaching the students about the various awards given by the ALA (American Library Association) each year. We discuss the Newbery, Coretta Scott King, Caldecott, and others during their time in the library every January. One of my favorite awards is the Caldecott which goes to the illustrator of children's picture books. 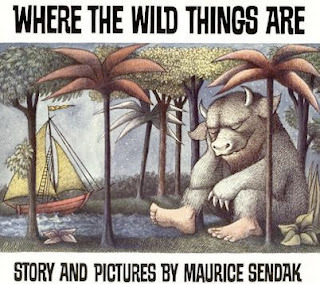 I share several of the books that I had as a child such as Make Way for Ducklings, Drummer Hoff, Miranda and Brother Wind, and of course my all time favorite Where the Wild Things Are by Maurice Sendak who was awarded the Caldecott Medal in 1964. 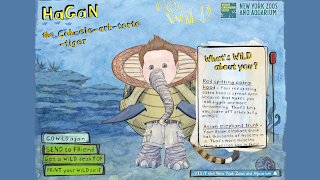 After I read Where the Wild Things Are, I introduced Build Your Wild Self (a fun web 2.0 tool that I shared in my last post) to the students. They had a BLAST making themselves wild over and over. 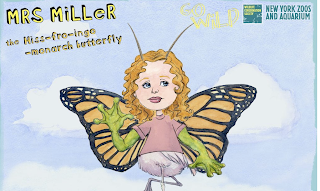 The cool thing about Build Your Wild Self is that once they are created the wild things can be easily shared to any email address. I will continue to add Slideshows to this post as our kids GO WILD at Van Meter over the next few weeks. Enjoy and try this great web 2.0 tool out for yourself! Here are the 4th Graders GOING WILD! You can watch this here too! Mindy Doggett, a second grade teacher at Van Meter, had her students make themselves WILD after a writing activity. You can see a few of their creations here! Colleen Tendall, who teaches in our secondary, recently shared a wonderful project with me! Her literature students created book projects for their semester tests. Collen's students read The Angel of Death by Alane Ferguson. They have been reading books from this series for the last couple of years. Her kids love Alane's work! Lauren B., who is a junior at Van Meter, created a Wordle to highlight the important topics in the book for her semester project. She also wrote a great summary to support the Wordle. I love the work Lauren has done! 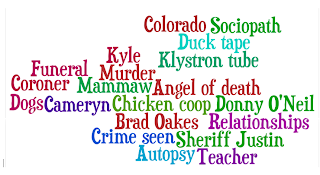 She shows that she truly understands the main themes in The Angel of Death through the Wordle she has created. Last week, Colleen told me something very exciting! She has been talking to Alane and they have set up a date for her students to conduct a Skype conference with her! I love how Colleen has connected her students through project-based and real life learning! This is an experience that Lauren and her classmates will not forget. We have Alane's books in the secondary library and they are usually available at the Scholastic Book Fair. Snow Day Web 2.0 Fun! "I want to do something fun!" "Mom, I want to play on the computer!" "I can't watch one more movie!" Hum....does this sound familiar to you? :) While at home today from school due to the blizzard I have heard Hagan, my 4 year old, say all of these things. He loves to watch movies with his big brother and sister, but like he said....you can only watch so many movies. He loves to play games, but that fun only lasts so long. Hagan is able to go to his bookmark folder on our iMac anytime. Usually he could play forever, but today he wanted to "make something like Brianna does." So this afternoon we set off to find some brand new Web 2.0 tools for Hagan and I to try. We went to my Diigo List of Elementary Web 2.0 Tools and checked out quite a few. Hagan created a Wordle by typing words that he knew. We created different animals at the Switcheroo Zoo. And we made Hagan into a Super Hero in The Hero Factory. The WINNER OF THE DAY was Build Your Wild Self! created by New York Zoos and Aquarium. With this fun Web 2.0 tool you can create a person to look like you and then WILD YOURSELF by adding horns, tails, snouts, wings, tusks, and much more! Hagan created himself as a Cob-Ele-Ark-Torto-Tiger and me into a Hii-Fro-Ingo-Monarch Butterfly! We laughed and laughed creating funny WILD THINGS out of everyone in our family. He even sent his Wild Self to Brianna and Grandma which is easy to do once you have one created. We added my Diigo List of Elementary Web 2.0 Tools to Hagan's bookmark folder today and these new favorites. I am excited to see what he will create next! Van Meter NEWS Heard at VOICE! There are so many exciting events taking place this week at Van Meter, I thought that all of this news should really be HEARD! My 7th graders in Technology and Information Literacy will be learning about YouTellYou from its creator Ruggero Domenichine! We are going to Skype with Ruggero who lives in New Zealand. YouTellYou is an amazing web 2.0 tool that lets you create photo stories about your life and share them with others through Twitter, Facebook, blogs, and other places. The 7th graders are very excited for learning experience and cannot wait to create their own YouTellYou stories with Ruggero. We will post our YouTellYou stories later this week. On January 28th Van Meter superintendent John Carver and Clayton Ridge Community School superintendent Allen Nelson have been invited to give testimony before the entire House/Senate Education Appropriation Committee. John's post from his Van Meter Think, Lead, and Serve Blog entitled Be Part of the Educational Transformation Proclamation will give you more details. This important event will begin at 10:00 am (Iowa time) on the 28th. We are hoping to get as many SHOUT OUTS as possible on Twitter to #vanmeter throughout the morning to show world wide support of educational transformation! 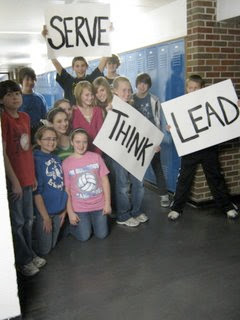 To learn more about Van Meter School you can visit us at the Think, Lead, and Serve Google site . Also, the ThinkLeadServe Wiki will begin to fill up with information throughout the week. calendars and make a difference! Van Meter NEWS Heard on VOICE! As a little girl I was surrounded by a wonderful collection of books. My Mom taught my sister Heather and I what the bright, gold and silver circles were on the beautiful picture books that we read with her. When Heather and I were in college at the University of Northern Iowa we looked forward to adding these Caldecott Medal books to our growing collections to use in our classrooms and read to our own children someday. And now as a teacher librarian I love hearing the books that were awarded special honors at the beginning of each year and sharing them with the students at Van Meter and my three children. On January 18 the American Library Association announced the 2010 award winning books at the Youth Media Awards Ceremony in Boston. There are dozens of awards that books can receive, but I must admit I have two that are my favorite! Being an artist and lover of picture books, the Caldecott Medal is always the first that I look for. The Caldecott Medal is awarded annually to the artist of the most distinguished American picture book for children. Several of the books that we read as little girls won Caldecott Medals and Honors such as Where the Wild Things Are by Maruice Sendak who was awarded the Caldecott Medal in 1964; Blueberries for Sal by Robert McCloskey who received a Caldecott Honor in 1949; and Ed Emberly who was honored with the Caldecott Medal in 1968 forDrummer Hoff. This year the Caldecott Medal was awarded to Jerry Pinkley for his brightly colored textured watercolor illustrations and story of The Lion and the Mouse. This amazing story of friendship between two unlikely friends will surely be a favorite in the Van Meter Elementary Library and my own home. All the World illustrated by Marla Frazee and written by Liz Garton Scanlon along with Red Sings from Treetops: A Year in Colors illustrated by Pamela Zagarenski and written by Joyce Sidman received Caldecott Honors this year. My second favorite American Library Association award is the Michael L. Printz Award for excellence in young adult literature. I got hooked on this award after Looking for Alaska by John Green won the Printz Award in 2006. Looking for Alaska is one of the my favorite all time books that made an impact on me as a reader and person. Year after year I find that the Printz Award is given to similar books that truly leave an impression on their readers heart. This year was no different! Excitement filled the air when Going Bovine by Libba Bray was awarded the Printz! That day I picked it up at Barnes & Noble to dive into the world of 16 year old Cameron. I am enjoying the adventure he is taking me on as a reader! I love Bray's books and loved the YouTube interview for Going Bovine. Check out Going Bovine and the Printz Honor Books below and go to ALA's site for a complete list of looking for the 2010 awards. I promise that you too will look forward to the announcement of these awards every January too! Going Bovine by Libba Bray Sixteen year old slacker, Cameron, sets off on a madcap road trip along with a punk angel, a dwarf sidekick, a yard gnome and a mad scientist, to save the world and perhaps his own life. Tomorrow we will celebrate the life of Martin Luther King, Jr. This is one of my favorite days because it gives me a chance to tell my own children and the students at Van Meter that we are all equal, wonderful, and can do anything we put our mind to. We surround our students with beautiful books and other resources about this great man in the library. I share online resources with the teachers and students to integrate into their classrooms and view during free time at school and home. I read my favorite Martin Luther King, Jr. book, Martin's Big Words by Doreen Rappaport and illustrated by Bryan Collierto, to all of the students. This week take time to look at the resources I have gather for Martin Luther King, Jr. Day and Black History Month in February. 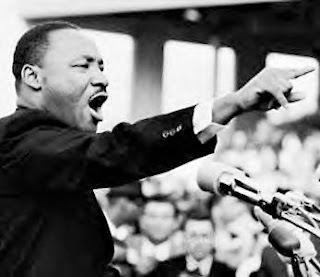 You can find these in Shannon Miller's Diigo Library List-Black History Month & Martin Luther King, Jr.
And please take time to watch the video of Martin Luther King, Jr. as he gives his I Have a Dream speech. Post the words of his speech so others can read them. Most of all, reflect and remember that everyone should have a dream and follow their passion! This will be one of the most important lessons you ever learn or teach a child. Van Meter Students Amaze Me! As the district teacher librarian and technology coordinator, I get to see a lot of the amazing work our students are creating at Van Meter! During the last week I have been blown away by our students, so I thought I would share a little of the work with you at VOICE! In the art room the students are creating digital portfolios of their artwork using Wiki's and other tools. Mrs. Comer sent me Eryn Schlote's senior art portfolio. Eryn has included pictures of her art work, information about herself, and a place to contact her. These portfolios will be such valuable resources for Van Meter students! I am always amazed at the work that comes from Mr. Hyer's junior high reading classroom. This year he has developed two outstanding Ning's: 7th Grade Reading Strategies and 8th Grade Reading Strategies. He wanted to provide students with a place to collaborate about reading and has he ever! Van Meter students have created several book projects throughout the year, iMovies about books, held in-depth discussions using the Ning as a platform, asked for book recommendations from other members, and much more. Last week, Mr. Hype added the "Chat" feature to his Ning and is using it as a backchannel during class. When I stopped in the other day to see how this was working I was excited to see the kids talking live about class between one another using the Ning. If you would like to join the Nings, click on the links above and request to join. Mr. Hyer and the junior high students at Van Meter would be honored to have you as members too! I added several student videos to the Van Meter Librarian YouTube channel. The 8th graders just made movie trailers for books they read. You must check out The Giver and Evermore! While you are at our channel watch Josh Porter's video entitled "What Technology Means To Me" that he created for a Facebook video contest. I am impressed every time I watch these videos! I will continue to add student and classroom work so subscribe to our channel so you can follow our Van Meter students and the great movies they are creating. You can also follow the Van Meter Bulldogs YouTube channel to connect to news and excitement from our district! After researching and gathering digital resources about Van Meter and the state of Iowa, my 7th grade Technology Literacy students created Glog's using GlogsterEdu. GlogsterEdu lets you created interactive, scrapbook like pages in which you can embed video, sound, images, movies, and more. We joined the Greetings From The World wiki this week after I met the creators on Twitter and they invited us to join this amazing collaborative project that has brought together several schools around the World! Van Meter's page on this wiki is going to fill up fast with Glog's from our school since several elementary and secondary classrooms are going to create Glog's. You can find Van Meter's wiki page here! 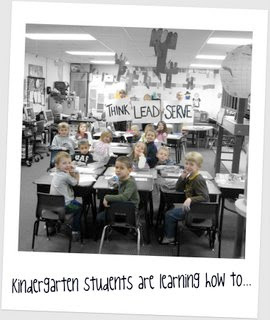 The learning and thinking is different this year at Van Meter! There is an energy within our school that is contagious and taking our students to places they haven't been before. And this is just the beginning. Van Meter students have been given the quest to find their passions and this is just what they are doing through inquiry, collaboration, creativity, and sharing with others in their classrooms, within the walls of our school, throughout the state, and all over the World! Lately a lot of people have been asking me questions and commenting about Twitter. I have heard "What is a Tweet? Did you say TwitThat? You retweeted what! " One night my family said "What is this TweetDeck and HootSuite up on the computer?" I even had someone ask "What is a Twitter?" I have been using Twitter now for 6 months and love how this tool has helped me build my PLN (Personal Learning Network) and make connections with others all over the world. Twitter is a social networking and microblogging service that lets users send and read messages called tweets. A tweet is a post that can be up to 140 characters in length and are posted on your Twitter profile page. Your tweets are also sent to all of your followers or friends that have tagged you to follow. You can send and receive tweets through the Twitter website and many other external applications. I use Hootsuite and TweetDeck to keep my Twitter organized on my laptop and desktop at home. I also have Hootsuite and TweetDeck on my iTouch so I can take it everywhere. Please don't think that this Twitter business made sense to me at first. :) I gathered some good resources about Twitter, added several friends that I found by networking through Twitter, and jumped right in. So try Twitter out too! You can follow shannonmmiller and the vmlibraryvoice to get you started. From the Twitter homepage, you can search for Friends. How about your favorite authors? Actors? Singers? Politicians? The possibilities are endless. I have compiled a Diigo List of Twitter Resources in my Diigo Library. These resources will give you ideas for different Twitter applications, ideas for learning, and things just for fun! Have fun and send a TWEET today! New Voices from the Van Meter Students! Over the last month, there have been several AMAZING blogs created by students at Van Meter! In the 7th grade Technology and Information Literacy Class I teach, the students are using their blogs as a digital portfolio of what they have created, learned, shared, and enjoyed throughout the seven weeks of class. When class is over, these students will continue to add to and share their blogs. I also have to share Emma D's Blog again. She is a 5th grader at Van Meter collaborating with me to create a blog for her class called WeTalk! We are working on digital book talks right now during library time and will add these soon to WeTalk. Emma also writes about technology and asks questions to get us TALKING on her blog. All of these new blogs are SUPER examples of how we all have VOICES and something to share with others. I am proud of our bloggers at Van Meter. As more are created throughout the year, I will continue to add more to this list. Let me know if you have a blog to share too! You can email me at shannon.miller@vmbulldogs.com or stop in the library to let me know. I would love to feature your blog on VOICE too!